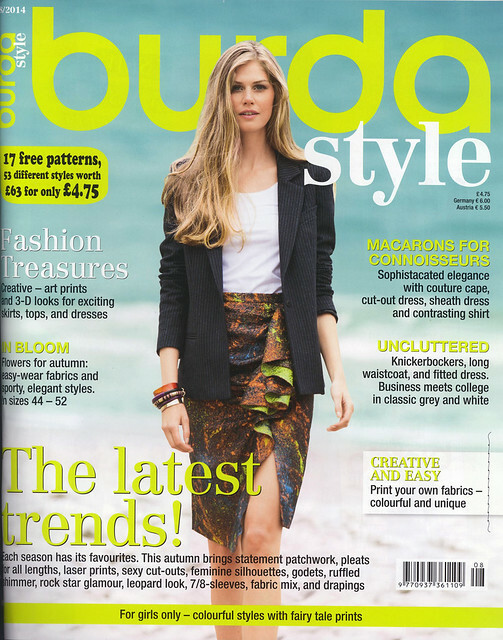 I’ve been subscribing to Burda for about four years and they seem to cycle through high and low periods. After the last stinker of an issue I expected them to be a slump for a few months but… this issue was surprisingly good! I’ll start with my favorites because I’m a “dessert first” kind of gal. 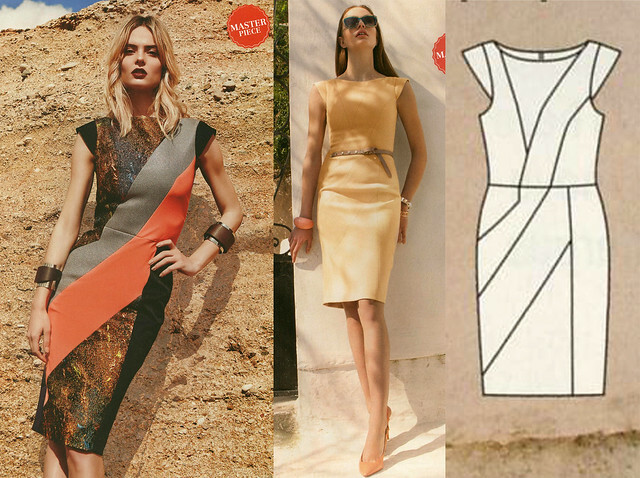 The crazy (in a good way) seamlines in this dress look great colorblocked or in a solid. I love the idea of the print mixing on the left. 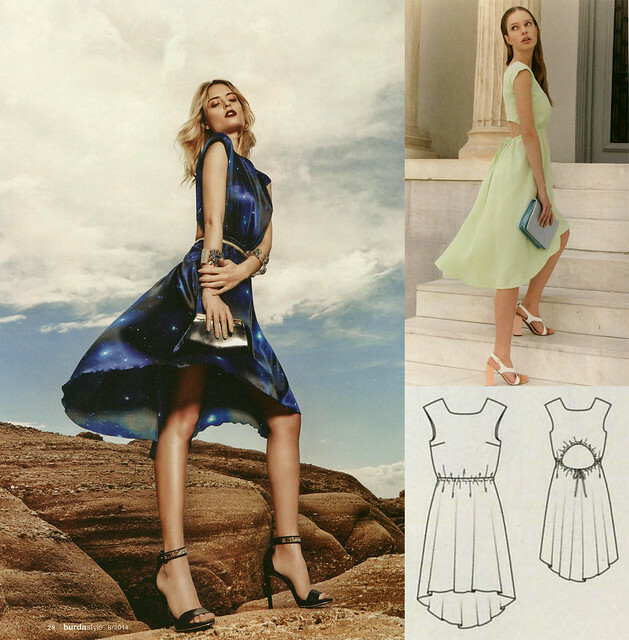 Or, I could see it in a solid with top-stitching to make the seamlines really pop. Or, how about a mix of black ponte and faux leather? So many possibilities. Burda’s put out a lot of good t-shirt patterns lately but this may be my new favorite. The v-neck combined with the way the shoulder pleats drape down the front are both vertically elongating – something I always appreciate. This faux wrap dress has pleated bands at the top edges. I have a RTW dress with a similar detail and for some reason it is the least gape-y of my wrap dresses. Maybe coincidence, but I’d be interested to make this and see if it lives up to how well the other fits. Weirdly they only showed this pattern made up once – I’m not a fan of the gold but it would look good in about any fabric. I might just be smitten with the galaxy print fabric here and the dramatic photography, but I love how breezy the back cutout and mullet hemline on this dress look. The dress appears to have elastic all around the back opening and also around the waist in front to keep the cutout in back from gaping open and showing too much. I’m a sucker for exposed zippers, so I like this top with a zipper set into the shoulder seam. Really it’s just a basic princess seam t-shirt with a few interesting details. I had to flip to the instructions on this one and figure out what was going on with the cutout detail in front. The instructions have you make a series of vertical slashes in the fabric, then take a strip of matching jersey and wrap around each one to draw it up in the middle. I don’t know if I’d go through the effort of making a sack dress to try this technique on, but it would be an easy project to try on a t-shirt from the thrift store. 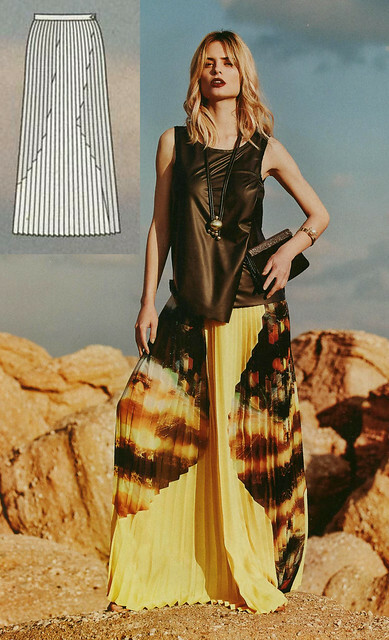 The idea behind this pleated skirt is also very cool. It has organic shaped pieces of a contrasting fabric blocked on the sides of the skirt, then the whole thing is pleated to make the seamlines look jaggedy. I’m just not sure if I like the actual seamlines here. 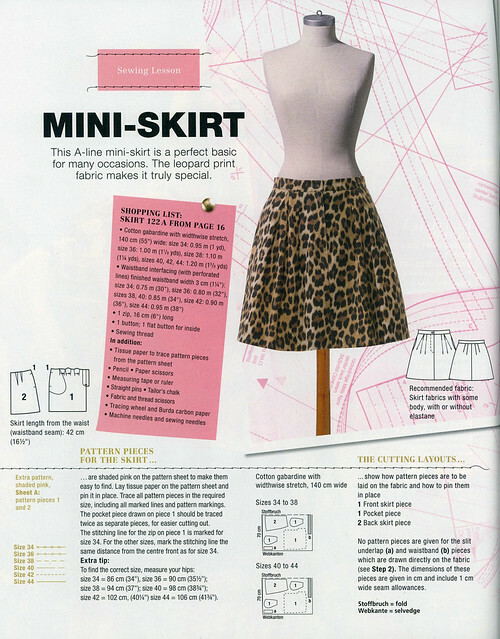 The sewing lesson with detailed step-by-step instructions and illustrations is this pleat-front mini skirt with pockets. It’s a nice, wearable basic you could make in a lot of fabrics. 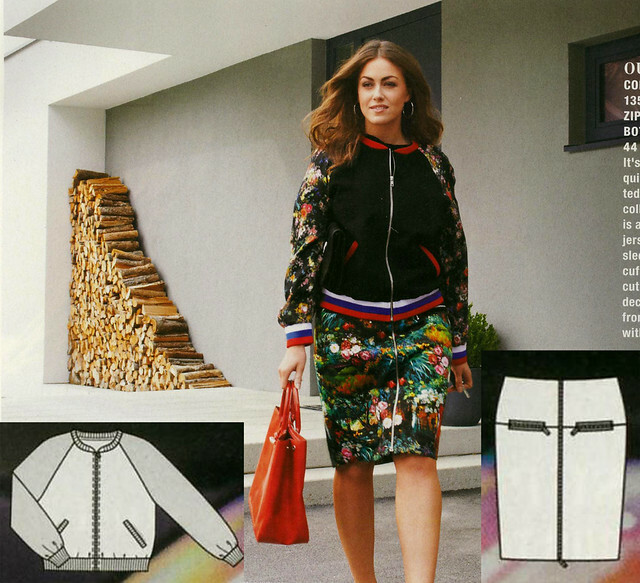 Onto the plus size section… Burda’s been putting out a different bomber jacket pattern about every month, but this time it’s finally in the plus size section. It’s not too late to get on the bomber trend bandwagon before fall, plus ladies! The skirt is a basic shape but I can see the multiple zippers looking great in leather or something a little tougher than this shiny floral fabric. I’m really liking how this dress is close fitting on top and flares out to a handkerchief hemline on the bottom. I’d bet it has great movement. The track pants here are very on-trend, and the kimono sleeve t-shirt with one pleated shoulder is a nice basic piece. Hold up, here comes the crazy! 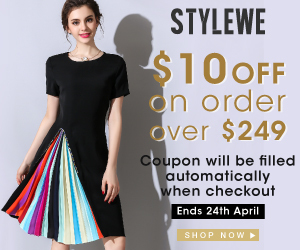 I’m not sure who the target audience for this dress is… someone who wants to look like they are wearing a different dress on the left than on the right? Who also needs a removeable collar and cuffs? Either she is an undercover spy who needs to change her look while sprinting through a crowd of people, or just someone whose mood changes faster than she can change her dress. I threw this one in to illustrate how much better it is to see something sewn up than to look at a line drawing. If I just saw the line drawing I would have guessed this top would be just my thing, but… eeesh, look at that photo. I would have guessed the pleats at the waist would have a slimming effect, but instead they look heavy and like there is too much fabric bunched up at the waist. Not to mention it kind of looks like she just got her top caught up in her skirt. Finally, the pièce de résistance! I’m not sure what Danielle Blaine standing on a ladder pulling plastic doves out of thin air has to do with “College Style”, unless… Is this clown college? No, magician college! And, just to make sure you don’t get your hopes too high for next month’s issue, I’ve thrown in a picture of the preview page. Clockwise from top left we have: Grease extras with a wardrobe malfunction, a fabric pretzel, mutton chop sleeves sewn to 80’s curtains, The Sound of Music, and some weird cable knit sweater with a kangaroo pocket on the back. I can hardly wait! Previous I’m A Winner! Thanks Infectious Stitches! I like the first dress that is color-blocked. Not sure how it would look on a big gal like myself, but on a Jo-Anna’s pattern sale day I’d purchase it. Great review! This one magazine I’m thinking of not renewing. It’s plus size patterns are slack in variety for me. Hilarious. 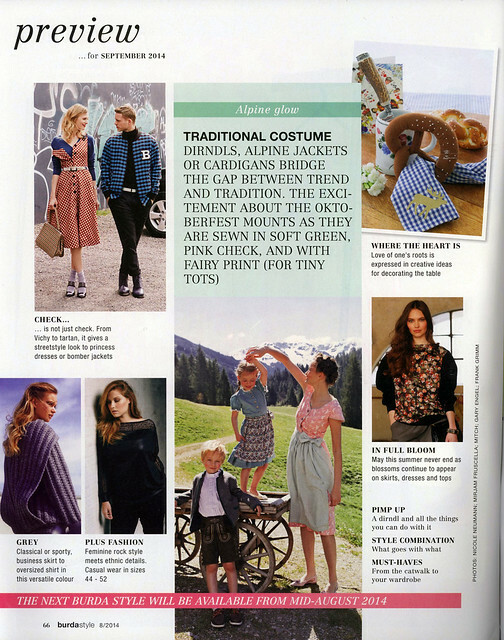 Dirndls and Alpine Jackets are cool, though. Men still wear Alpine Jackets for business in So. Germany and Austria. Love the all the dresses you featured. I mostly just love the fabric that Burda uses. Q: What is a good idea when buying tracing paper: 36″ width or 24″? I’d go for the 36″ if possible because the more pieces you can turn sideways the less paper you’ll waste. Either works though. OMG!! I just found this blog via Instagram and I’m so happy. Too funny and I agree 100% with everything you said. My fav was the first dress. Is it only available in the mag? I wonder if I can purchase just that pattern? Thanks for the laughs! Hey! Thanks for following! I think you can purchase the dress pattern only, but off of their website, I think. Jamie will know for sure. I’ll check. Yaaaay! Thanks so much. I’m def making this one. Thanks again for the great content too! Love your reviews! You are spot on and your language engages me. “Mullet hemline” – Perhaps THAT is why I have not gotten into this trend! Thanks for sharing the Burda likes and dislikes. I can see why you like the likes. I subscribe to the US edition and it has been total disappointment – for me. I guess other subscribers may like the designs. As they say, to each his own. The one or two designs that I have wanted to make in each US issue are not available on the insert but I have to go online and pay for that particular PDF (and it should be free to subscribers). I’m really confused about the paying for the digital patterns thing! I only bought the first US issue and there was a coupon code to enter that would make the digital patterns in the issue free. Someone else told me that wasn’t the case in their issue so I had to look… yup, it seems like the code went away and you have to pay for them now. If I was a US subscriber I would be PISSED! Jamie! Love the first dress too and the idea of using ponte with faux leather. Does the faux leather have a bit of give to it?